Once again Tom O’Brien has a quarterback on the NFL Draft radar. Glennon is following the footsteps of Matt Ryan, the Hasselbeck brothers, Brian St. Pierre, and Russell Wilson whom O’Brien has coached with his last two jobs (Boston College and NC State). 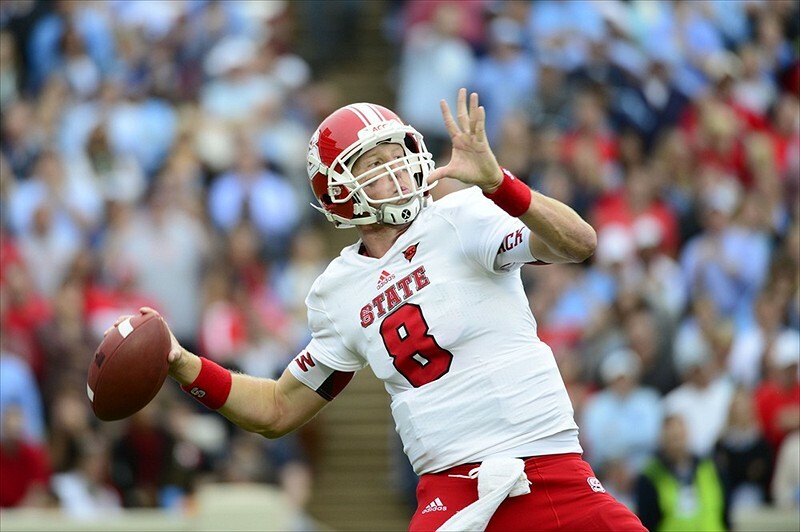 His career numbers at NC State of 63TD and 31INT with 7,411 passing yards are good for a two-year starter. He played in the ACC in which he played defenses like UNC, Clemson, Florida State, Virginia Tech, and Miami. Last time I checked they were very mediocre to average defenses. There are qualities I notice in him that lead me to believe that he will improve. Remember people you don’t to be a Tom Brady or a Peyton Manning to win Super Bowls. He’s similar to the second-tier QB’s of Matt Ryan Eli Manning and Joe Flacco. One other noticing fact is that without WR TJ Graham in 2012 he threw more INTs. In 2011 Glennon threw 12INTs, in 2012 he threw 17INTs. Once again I stress the importance of an outside threat in the perimeter. Like Matt Ryan and even Joe Flacco as well as Eli Manning he’s tough, he’s a gunslinger, shows fearlessness. Glennon played poorly in the senior bowl but so did every other QB so I ultimately think the combine and individual workouts will the judge of where he goes. Even with that he works best in play action and the ability to attack the deep right-center part of the field like Joe Flacco. I feel Flacco and Carson Palmer are the most similar to his intangibles and his kind of game. NC State may not be an elite program but Glennon played his best in that 2nd half vs. Florida St a team in the BCS title conversation at that time ranked #3. Glennon also didn’t have the elite supporting cast the previous two quarterbacks had. But it was no reason for losing, he didn’t glamorize with the numbers, he’s just a blue collar player. He may climb up the board as the first quarterback taken according to Mel Kiper and Todd McShay but to me he’s levels below the top two guys in fact I think he’s one of those guys where he’s years away from excelling in league. He’ll be over drafted because all QB’s are. But ultimately I think he should be a 3rd-4th round pick. Nothing against the guy but a lot of last yrs. guys were better as I said with Tyler Wilson.